Aware that satan is never resting in his bid to destroy God’s heritage on earth, Prophet T.B. Joshua was led by the Holy Spirit to locate the spiritually-oppressed and to declare them free in the mighty name of Jesus. 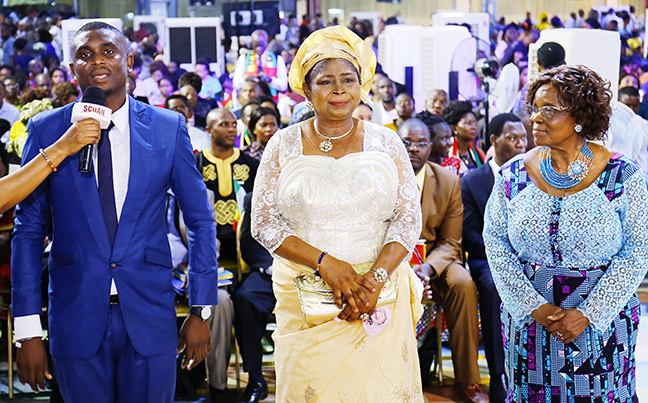 As he laid hands on the congregation, many were emancipated from demonic oppression while those who had been suffering from all forms of career setbacks were redeemed, restored and blessed abundantly. It was indeed another bad day for the kingdom of darkness as all its plans were truncated by the power of the Living God. Like two failed aircraft engines ominous of a crash, her lungs had been rendered ineffective due to a condition known as fibrosis. In spite of India’s surging reputation as a world power in the medical sciences, all efforts to get a solution for her problem proved futile. Being a vital element of the human system, oxygen, when obstructed due to any condition, could lead to dire consequences, including sudden death. Mrs Marie Monis could not breathe due to her ailing lungs. And their inability to effectively oxygenate her system also led to other problems such as her inability to walk. To live artificially, a special oxygen machine was recommended for her. But even with the machine, she knew in her heart that it was not going to be a hundred percent okay. She had no other choice than to seek the face of God. In doing that, she reckoned that a visit to The SCOAN would be the beginning of her healing and triumph over a medical condition that had wrecked her entire wellbeing. Attending The SCOAN Sunday service on April 23, 2017, she had an encounter with the Spirit of God. 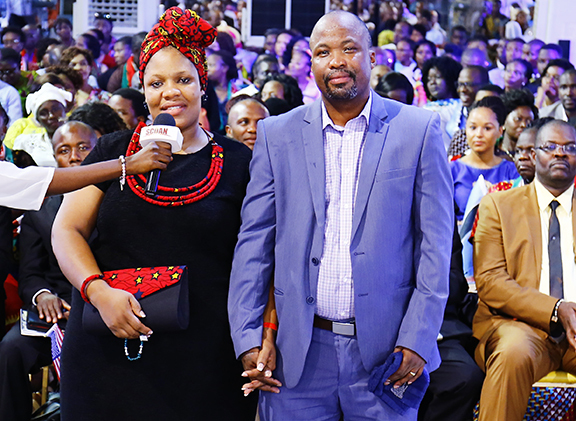 Eager to set herself free from the debilitating grip of her condition, Mrs Monis called out to the man of God as he ministered healing and deliverance to congregants. Her voice, a blend of anguish and anxiety, attracted the attention of Prophet T.B. Joshua who was led by the Holy Spirit to the position where she was. As soon as the man of God laid his anointed hand on her, the woman found herself on the floor, lost in a world she could only imagine. Recounting that glorious experience during her testimony, she told congregants that she really did not know what happened to her as she laid on the floor, vomiting all the accumulated phlegm in her lungs. According to her, when she eventually got up to her feet, she felt light and energised as opposed to her previously frail nature prior to the healing. 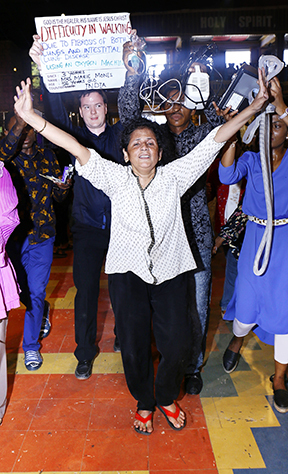 Walking with renewed agility to the admiration and applause of the congregation, Mrs Monis declared her healing in grand style, thanking God for healing her in Jesus’ name. “I’m feeling so great. My mighty Lord has healed me”, she exclaimed. She advised people not to believe in doctors, adding that, the Lord is the Doctor of doctors! Since 2013, one of the signs of true womanhood had ceased to exist in her. For reasons she could not understand, her menstrual cycle had stopped abruptly, forcing her to part with a lot of money as she visited many hospitals in search of a permanent solution. Rose did not find her condition funny. Worse still, she had kept the problem to herself as a top secret, thinking she would become a laughing stock and also hoping to stumble on a way out on her own. But the more she tried to rely on self-effort, the more confused she became. Her entire quest to unfold the mysteries behind her problem only ended in a mirage as there were no clues as to what was actually wrong with her. At some point, infections set in, owing to the inability of her reproductive organs to excrete unwanted blood through menstruation. Her visits to hospitals only left her broke and added no value to her situation. Confounded, worried and uncertain about the next move to make, Rose was left with no other option than to heed the perennial advice of her brother who had been harping on the need for her to visit The SCOAN. Last Sunday, the Edo State of Nigeria indigene attended the church service in expectation of God’s intervention. As Prophet T.B. Joshua ministered healing and deliverance to the congregation, the mighty hand of God touched her. “When the man of God was praying, something touched me and the blood started flowing. Both the head and stomach aches have disappeared. Thank you Jesus!”, she declared. During her testimony, she told congregants how she had been mocked by her peers who boasted to have had their children while she was unable to conceive. She however thanked God for using Prophet T.B. Joshua to rewrite the story of her destiny in Jesus’ mighty name. 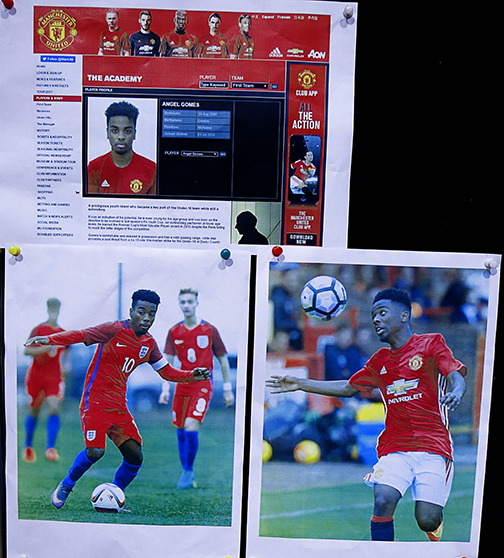 A very talented player, Mr Angel Gomes had established himself in the Manchester United Under 17 Academy only for injuries to threaten his progress as a professional footballer. One thing which he found unacceptable was the fact that those injuries usually rear their ugly heads at very crucial times in his career. He has had to undergo treatments for groin, hip and ankle injuries recently, albeit, the treatments could not guarantee a hundred percent fitness. As nagging as they had been, his elder sister knew that they would not escape the anointing at the Arena of Liberty and so, one of the best gifts she would ever give him was to accompany him to The SCOAN, even though he had been acquainted with the ministry for a while. As captain of the England Under 17 male football team, Mr Gomez is no doubt an important part of the team’s success. He was therefore in an urgent need of God’s help. During the last Sunday service, Angel was among the multitude that received healing as Prophet T.B. Joshua ministered prayer and deliverance to the congregation. 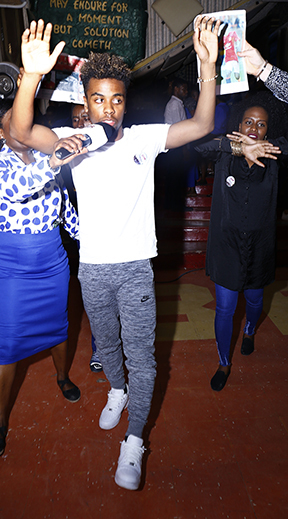 Declaring that it was awesome being a partaker of that memorable service, he told congregants that he felt something akin to an electrical shock as the man of God laid a hand on his head. “My legs are feeling much stronger now. The pain in my hip and groin is gone. The pain in my angle is going also”, he said during his testimony in company of his older sister. Jogging before the congregation, he no longer showed any sign of being unfit. “Don’t doubt God; have faith and look unto Him”, he advised as he hinted that he was going straight to join the English Under 17 squad for the European Championship Qualifiers. 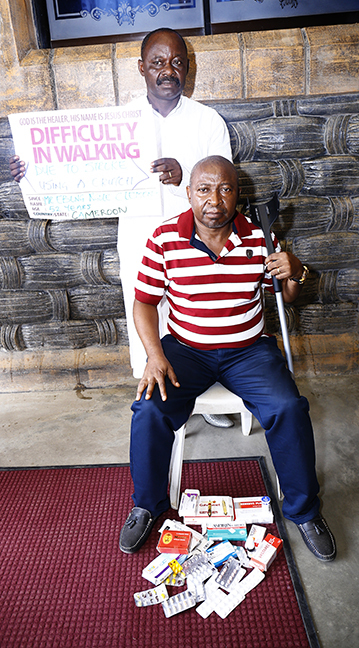 Mr Ebong Clement had been bombarded by different ailments that forced him to resort to the use of a crutch. High blood pressure, partial stroke, excess cholesterol and diabetes made him almost unable to walk as he resorted to the use of heavy medications which ended up not helping matters. Aside from the many hospitals he had been to, he also patronised traditional healers but they failed to proffer any solution. 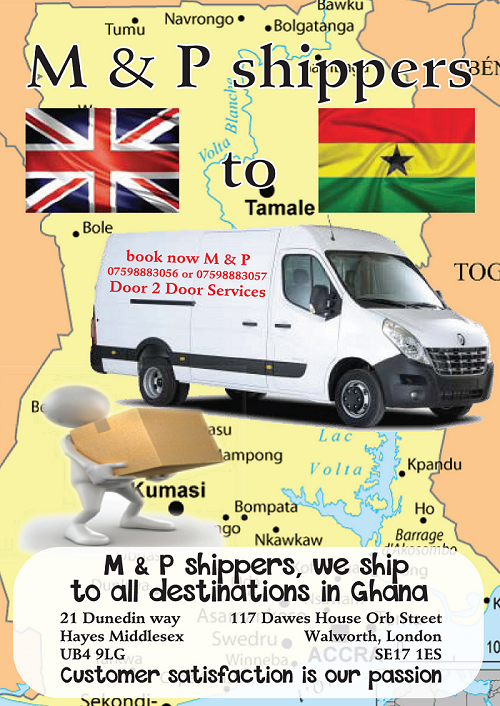 For the Cameroonian, his business was worse-hit as he could not run around to tidy up deals. Having tried all options available, Mr Clement decided to visit The SCOAN. 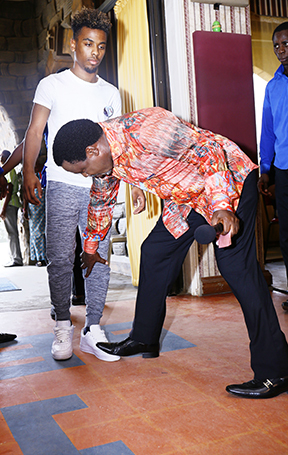 He was in the auditorium during the last Sunday service and received the anointed touch of Prophet T.B. Joshua. According to him, his healing came almost as spontaneously as congregants started to celebrate even before the man of God prayed for him. And so, by the time, he was ordered to rise and walk, he obeyed and walked without aid for the first time in a long while. Testifying in company of his friend who is a medical personnel, Mr Clement glorified God for healing him even at a point when he was planning to travel to Italy for better medical attention. Even his friend, confessed that he had known the reputation of The SCOAN long ago, adding that as a medical personnel, he only treats while God heals. He added that any nurse or doctor who does anything without God would not succeed. “When you seek the face of God, you will get the solution”, added Mr Clement as he beamed with ebullient smiles. Having been imbibing the teachings and counsels of Prophet T.B. Joshua, Mr Bestman Odey had always nurtured an optimistic mind-set – to be the best he can be at all times. As a worker in the Youth Department of The SCOAN as well as a chorister in the ministry’s choir, he has always seen an interaction with the man of God as a rare privilege and has also drawn great inspiration from the wise words of the man of God. 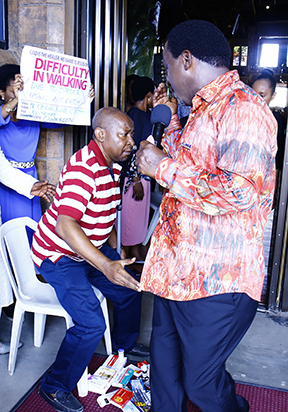 During one of the meetings with the man of God at the prayer mounting, the youths were inundated with information concerning an academic window of opportunity through a professor from the University of Nigeria, Nsukka. Being an aspiring youth with remarkable appetite for success, Bestman keyed into that window of opportunity and was selected as one of the candidates to study for a diploma in Linguistics at the prestigious Nigerian institution of higher learning. While studying for the diploma course, Prophet T.B. Joshua ensured that Bestman did not lack anything. Aside from sponsoring his studies, the man of God made ample provision for his accommodation, feeding and general wellbeing. The investment paid off eventually as Bestman went ahead to graduate with an Upper Credit Diploma in Linguistics. Poised for the attainment of higher pedestals in his academic aspirations, the young man from Delta State, Nigeria, enrolled for his degree programme in the same institution. According to him, the scholastic journey was not a stroll in the park. Remembering the words of Prophet T.B. Joshua that the journey to the throne is not a bed of roses, Bestman gathered himself together to face all the challenges that stared him in the face with the gusto of unrestrained youth. Reverting to the man of God from time to time, for spiritual direction and guidance in the face of the vicissitudes of life, the young man soldiered on like the true son of God’s General. Every valley of lack and confusion that arose was levelled through the fatherly intervention of Prophet T.B. Joshua. At the end of his studies, Bestman graduated with a First Class Honours in Linguistics – a rare feat amongst the youth of today, most of who prefer to chase the ephemeral pleasures of life. No doubt, Bestman has not only done himself and his family proud. He has also proved to be a true ambassador of The SCOAN – a ministry of international repute, raising sons and daughters of love with a great future. Indeed, all is well that ends well! Testifying last Sunday, in company of his mother and the God-given professor that created the opportunity for him to excel, Bestman told congregants that he has been offered employment as a Graduate Assistant in the same institution. He remembered the peer pressure that almost scuttled his illustrious ambition and how he was able to triumph through the counsels of Prophet T.B. Joshua. He also recalled how he was able to overcome a nagging headache that often reared its ugly head whenever examination time approached. “Be focused and determined. Don’t allow your situation to weigh you down, no matter what you are passing through; no matter the names people will be calling you, don’t get discouraged. Focus on God. Focus on your studies and always remember that the best is yet to come”, he advised youths all over the world. She was a hard nut to crack for her husband to the extent that he once harboured thoughts of leaving the house for her. She had no regards for him, sometimes accusing him of running after women. There was a near-fatal occasion when she wanted to seize the motor steering from him while he was on very high speed. Mrs Yvonne Rapati did not even consider the fact that her husband is a police officer who could use his office to deal with her. She threw caution to the winds and held sway as the ‘man of the house’. At a point, she had tried to wrest his gun from him and shoot him but for divine intervention. Unknown to the South African woman, she had been under the influence of an evil spirit, a spirit husband, which had turned her into a play thing. Even though she acknowledged being born into a fetish family both on the maternal and paternal sides, she never had an inkling that her words and actions were controlled by an extraneous force. While her husband maintained a peaceful mien, Yvonne was always on the lookout for trouble. She was a habitual trouble shooter, who even in the presence of visitors would shout her husband down as though he was her houseboy. Her children were also at the receiving end of her hostile nature. She would talk to them in very harsh tones as if they were strangers to her. In spite of her unbecoming attitude to her husband, he was not totally pessimistic about her. He had always thought that perhaps, the mighty hands of God would locate her someday. While her husband was looking up to God for help, Yvonne would boast that even if she comes to The SCOAN, she will never manifest. She spoke with unbridled effrontery that sometimes sent shivers down the spine of her husband. All his efforts to get intimate with her, as husband and wife are wont to do, ended up in frustration. She would not even allow him to touch her. Most times, they slept apart, leaving Mr Rapati perpetually married to his pillow. He really needed to express his love and affection for his wife but as things stood then, it was as if he was looking at the Promised Land but could not find his way through. Mrs Rapati would abandon the house chores to her husband to the extent that he would have to bathe the children. It was so bad that he even cooked his meals. Whenever he queried her, she would complain of tiredness. According to Mr Rapati, he was virtually reduced to a prisoner in his own house. For those twelve years of frustration in his marriage, he had endured so much from his wife. Describing his wife as a very good woman when they first met, he however wondered how things took a turn for the worse. He recalled that his wife transmuted into a slave driver after they had their first child, adding that she often got angry after listening to gossips from people who told her negative things about him. Being an ardent viewer of Emmanuel TV, Mr Rapati was acquainted with the teachings of the man of God concerning forgiveness. He therefore decided to imbibe those teachings rather than react negatively to his wife’s overbearing attitude. But for God, he had once planned to axe his own mother to death on account of some top secrets she had revealed to his estranged wife about him. It got to an extent that he could no longer bear the psychological trauma emanating from his crumbling marriage. It was at that juncture that he decided they would travel to The SCOAN. 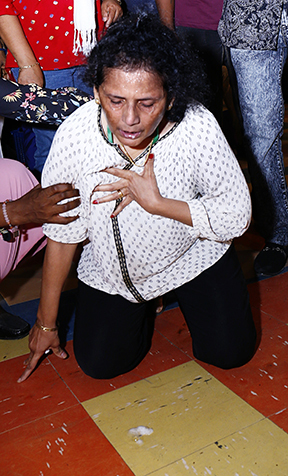 Her actions, being tele-guided by an evil spirit, Mrs Rapati had said she was going to relax in her sister’s house as their journey to The SCOAN approached. Somehow, the power of God prevailed and the couple eventually landed at The SCAON. During penultimate Sunday service, she was located by the man of God as he ministered prayer and prophecy during the church service. 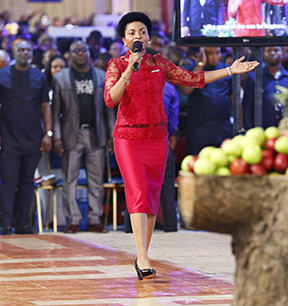 Manifesting the evil spirit that had held her life hostage, the woman who once boasted that she would never manifest even if she comes to The SCOAN, came under the influence of the Holy Spirit. Confessing through her, the evil spirit enumerated how it had tormented her in her career and marriage. Taking authority in the mighty name of Jesus, the man of God commanded the evil spirit out while Yvonne landed on the floor. When she eventually rose to her feet, it was obvious that a burden has been lifted off her shoulder. Thanking God during her testimony, together with her husband, Yvonne expressed joy for the new-found love in their marriage. She advised people all over the world to desist from fetish associations and put their trust in God. In 2004, Mr Chris Okafor had noticed that while urinating, his urine would not come out at once. The flow was epileptic. Confronted with that ominous reality, he consulted his doctor who recommended a series of tests. The results of the tests confirmed that he had a tumour in his prostate. According to the doctor, the cancer was already spreading to other parts of his body. That piece of bad news jolted Mr Okafor. Suddenly, he started emaciating while his complexion also darkened. The greatest challenge he faced was that he had to be patient whenever he was urinating because the fluid would not flow normally. It came and ceased intermittently. 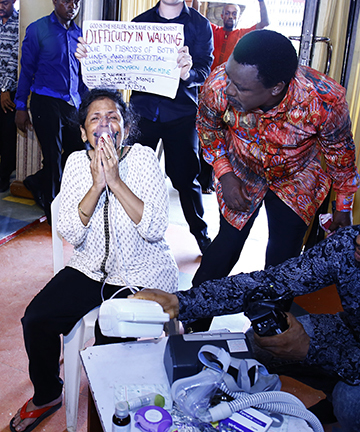 Having been to a couple of hospitals, including one in India, Mr Okafor visited The SCOAN where he received prayers from the man of God. He received both the Morning Water and the Good Morning Sticker. Ministering the anointed materials to the areas where his ailing prostate was located, he believed that God would turn his situation around. In a matter of weeks, the symptoms he was experiencing started disappearing gradually. As at last Sunday when he testified to his healing, all those symptoms were and are no more. Further tests also showed that there is no more cancer in his body. According to him, the prayer of Prophet T.B. Joshua actually stopped the spread of the cancer. His submission stems from the fact that all the tests both in Nigeria and India are unanimous in their report that there is no longer any trace of cancer in his body. Displaying his recent medical reports before congregants, Mr Okafor was filled with joy and gratitude to God for using Prophet T.B. Joshua to heal him of an ailment that is usually very difficult to cure or manage. 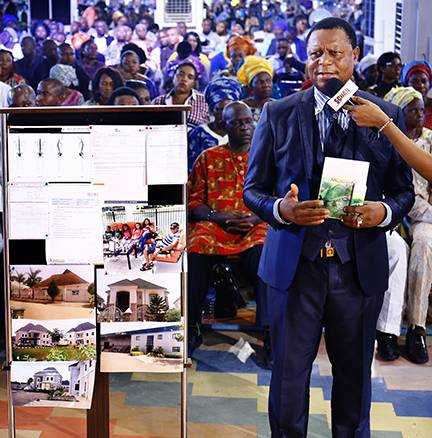 Mr Okafor also testified to the casting away of the yoke of barrenness from his life when he visited The SCOAN many years back. Today, he is a proud father of four kids. Aside from his elevation to a Nigerian representative of an international company, Mr Okafor is also blessed with two massive houses in his own town. All that happened after prayers with the man of God and ministering the Morning Water. “Seek ye first the kingdom of God and everything shall be added to you”, he advised. After his secondary school, Pascal was learning a trade with his elder brother and was doing well before the devil lured him into the business of the underworld. Buying into a friend’s idea about traveling abroad, he had stolen his brother’s money (Three hundred thousand naira) and had planned to use it to pay his way abroad until the plan hit the bricks and eventually and left him stranded in Abuja where he hooked up with bad friends who helped him squander the money as they went clubbing and engaging in all sorts of prodigal behaviours. While he was away, members of his family were not finding his absence funny. They even insinuated that his elder brother was planning to use him for a money-making ritual. The same brother would eventually track him to Abuja to lure him back to their hometown. After receiving some punishment for his misdemeanour, Pascal absconded from home and pitched his tent at a motor park where he became involved with a gang. Alongside members of the gang he met at the motor park, he became acquainted with the hideout of armed robbers and the places where they kept their ammunition after every operation. He had bidden his home goodbye and nothing in this world would bring him back. With time, he became the robbers’ arms keeper and ran many errands for them. Pascal later partook of a couple of robbery operations both successful and unsuccessful. Along with his gang, he would rob passengers on interstate journeys. But for the fact that he also harboured some passion for education, he struggled to get admission into a polytechnic in 2001. As soon as he joined the polytechnic, he got initiated into the Supreme Vikings Confraternity. He underwent Initiation Through Torture (ITT) – a nocturnal ritual meant to harden the minds of initiates. His initiation into that cult group exposed him to different types of sophisticated weapons and assorted charms both for protection and bullet impenetrability. One day, Paschal met his waterloo after a failed robbery operation in which he was arrested by the Special Anti-Robbery Squad in Enugu State, Nigeria. After interrogating him alongside another gang member whose identity he could not reveal to the security operatives due to the oath of secrecy which they had sworn to, Pascal was taken to another location by the police and shot three times – with the bullets piercing his armpit region and coming out on the other side. He was presumed dead by the police who left him in a pool of his blood. But like a Spartan, the Anambra State-born rose to his feet when it dawned on him that he was no longer under any surveillance. Escaping to Republic of Benin, Pascal took time to treat his bullet wounds under the watchful eyes of his elder brother who is now a minister of God. 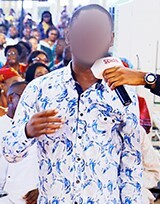 All efforts to lay his hands on a gainful venture proved abortive and in an attempt to rid himself of those haunting memories of his ungodly past, he visited The SCOAN penultimate Sunday and was located through prophetic insight by the man of God who also traced the root-cause of his problem to the family. According to the prophecy, he would soon be shot dead if he didn’t surrender himself to God. Pascal received his deliverance in the mighty name of Jesus. The jubilant congregation was so happy that a lost sheep has finally been reunited with his Father through Prophet T.B. Joshua. Declaring that he is now a new creation, the man of God promised to help the repentant young man nurture his new-found freedom from sin and sorrow. According to Prophet T.B. Joshua, the ministry would do the needful to make Paschal continue to shine in the refulgent glory of a new life made possible by the unending mercies of God through His son Jesus Christ. This entry was posted in Featured Articles on April 14, 2017 by TB Joshua Fans UK Blog. WARNING Beware of any imposters claiming to be Prophet T.B. Joshua or claiming to represent The Synagogue, Church Of All Nations, demanding for money in the name of either of the above in the promise of providing Anointing Water or other materials from the ministry. The Anointing Water is not for sale! Healing, salvation and all of God’s blessings are free gifts of God. Jesus Christ paid for our perfect and complete healing when He died on the cross. Watch and pray, lest you fall into temptation (Matt 26:40). TB Joshua - where does spiritual husbands & wifes come from? Our Visitors Around The World……..
TB Joshua Fans UK is licensed under a Creative Commons Attribution-NonCommercial 4.0 International License. Based on a work at http://wp.me/DCpC.